My Fair Lady is nestled in the quaint countryside of Co Monaghan. Two minutes off the N2 between Castleblayney and Carrickmacross, we are 50 minutes from Dublin and 1 hour and 20 minutes from Belfast. Surrounded by the picturesque rolling hills of Monaghan our showroom is the height of exclusivity and privacy. To ensure that you receive our full attention and to make your experience more personal our boutique is by appointment only. We open 5 days a week from 10 am to 4 pm Monday to Saturday. We close on Wednesdays and Sundays. Evening appointments are available every Tuesday for your convenience. Our Boutique showcases a beautiful range of exquisite bridal and bridesmaids gowns from Mori Lee, one of the world’s foremost designers in bridal wear. 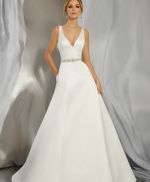 Our knowledgeable, friendly staff insists that each and every one of our brides feels welcome and comfortable in their private appointment allowing them to relax and enjoy the experience of selecting that one very special dress. At My Fair Lady Monaghan, we love what we do. Nothing makes us happier than seeing our brides glow from the inside out in their perfect dress. 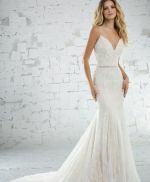 We are experts in all things bridal and have a reputation for helping Brides find their Dream Dress to suit their Dream Day. With years of experience in the bridal industry, we have families of My Fair Lady Brides. This is a constant source of pride for us and we adore the opportunity to make each and every sister, cousin, aunt and friend feel just as special as the last. Making these memories with our brides is as important to us as it is to them. We are honoured and delighted to be a part of such a momentous milestone.